Did you not find the right corpora for you? Do you deal with subject-specific language? 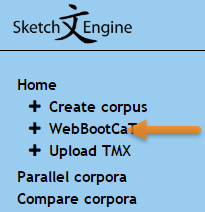 WebBootCat is a simple intuitive tool to create a user corpus by automatically downloading relevant texts from the internet. After logging in, click WebBootCat. This example shows the first option. (4) Type the seed words, the list does not have to be exhaustive. You can repeat the procedure with different words to harvest more texts later. Sketch Engine will start downloading the texts from the web pages and will also process the texts for use in Sketch Engine. With large numbers of pages, the process can take several minutes to complete. The process is over when the progress bar reaches 100%. Texts which are too short or have other issues will be excluded. Relevant texts are downloaded, tagged and processed for duplicates or text unsuitable for inclusion into the corpus. Your corpus is ready to use now. 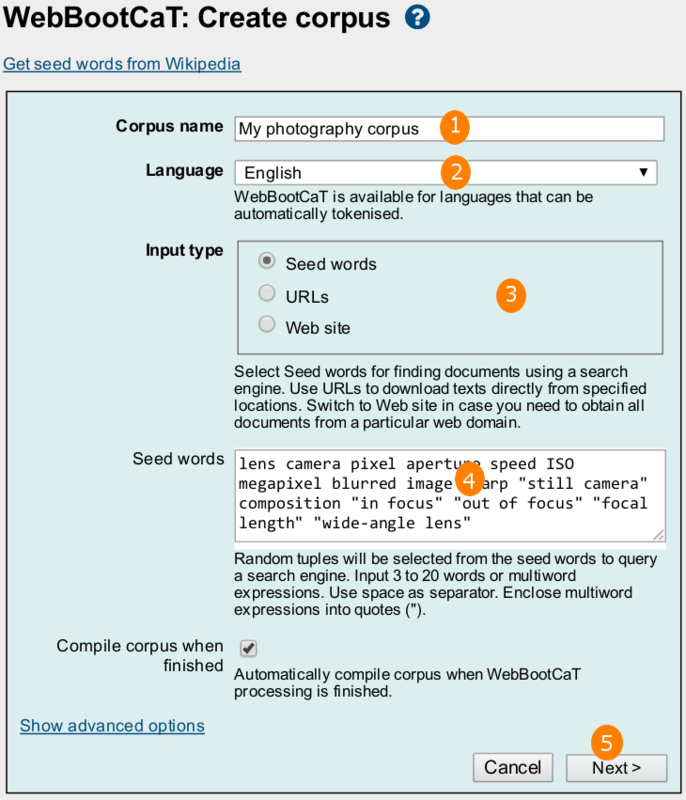 Click Home in the main menu, go to My corpora a select the newly created corpus. Use the main menu to generate word sketches, thesaurus and to with the corpus as normal. Sketch Engine is not a public cloud. Texts you upload will be stored in your personal space in your account. Other users cannot access your texts. You can, however, choose to grant access to other users. To learn more about user corpora, please refer to the User manual.